Most developed countries have established solid waste management practices to deal with different types of waste in economical and environmentally friendly ways, including industrial and hazardous waste, medical waste, construction and demolition waste, agricultural waste, waste-water sludge and special waste types such as tires, end-of-life vehicles, and electronic waste. However, Lebanon underwent a crisis in 2015 due to its difficulties in dealing with its municipal solid waste, which culminated in uncollected waste piling up in the streets and illegal open dumping and burning. While an emergency plan has been enacted and the visible effects of the crisis have been managed, many challenges are still preventing the development of long-term solutions. From previous experience in setting up national waste strategies, we believe any long-term plan should strive to answer crucial governance questions while developing a strategic focus on treatment methods, financial instruments and other technology and process enablers. The primary drivers of the waste crisis in 2015 were weak governmental planning and a sharp increase in population due to the inflow of refugees fleeing the Syrian Civil War. The latter put a strain on the already-burdened infrastructure, and eventually led to the Naameh landfill closing and the subsequent crisis. While the impact of the population surge had serious consequences in the short term, the long-term implications might be less severe, considering the country’s total population is expected to decrease with a CAGR of negative 1 percent starting in 2018. 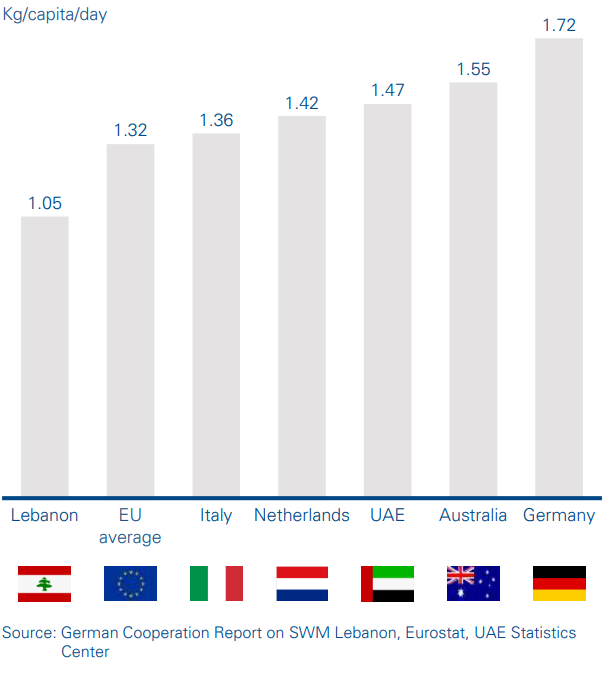 Nevertheless, municipal solid waste (MSW) generated in Lebanon is still expected to increase from 2,040 thousand tons in 2014  to around 2,653 thousand tons in 2025 due to an increase in the daily production rate of MSW per capita (the current level is 1.05 kg per capita per day  which is well below EU average). Since the waste collection crisis in 2015, Lebanon has established an emergency plan entailing the construction of two coastal landfills in Bourj Hammoud and Costa Brava, respectively. Environmental controversies have followed, including possible dumping of waste in the Mediterranean Sea, in violation of the Barcelona convention, as well as open burning by some municipalities. Estimates report that the country currently only treats 23 percent of total MSW weight (8 percent material recovery and 15 percent composting), while 77 percent is directed to landfills or open dumpsites . In comparison, Germany and the Netherlands landfill less than 2 percent of the total MSW they generate, while diverting the rest through various techniques including recycling, composting and waste to energy (WTE).